I would like to anticipate my conclusion directly. 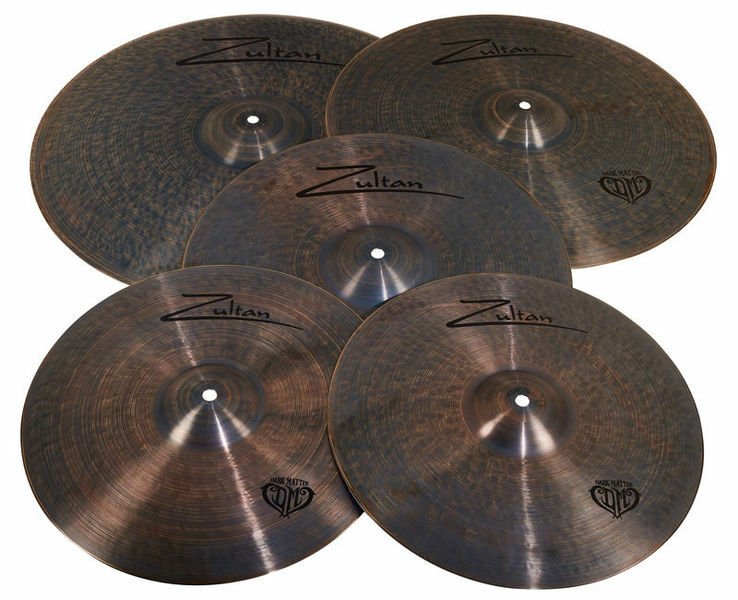 These hand hammered cymbals just sound fantastic and have a very exclusive look! I've had good experiences with B20 pools so far. So far it has been the Masterwork (Troy series), the Zultan Aja or Rockbeat Becken. Surely that is a matter of taste, because what these pelvis all have in common is the rather dark basic tone. Again, the basins of the Darkmatter series make no difference. However, in comparison to the Troy cymbals they solve the sound much more clearly. It is really unusual how much sonority the cymbals already develop in light touch. But if you play with a bit more power, you will not overdo it, but you will always be powerful and accentuated. They are not too light weight to beat them as "thins" but also not so "heavy" that the sticks break off at them. For rock, alternative and metal definitely very good. The processing is 1a and there is (in my set) visually and technically nothing to complain about. The 16 "crash responds quickly, but remains extremely clear in the heavier continuous use and does not lose sound - a big difference to the Troy and other series of Zultan. The 18 "is great and great to use as a groove cymbal, it creates the desired sound carpet without blurring too much. The 20 "Ride impresses with a clear ping and can rise like lightning fast like a crash ride, which is just right for my taste.The Bell is loud and not to be missed - great! The 14 "hihat sounds pretty rough and trashy when you play it half open, but when closed, it's crisp and bright. Outstanding for me and compared with eg the Meinl Classic Customs by lengths better in sonority! Last the optics. I have a dull dark shellset and these cymbals just look so good on it. But above all, they stand out from the crowd of brilliant finish or the whole kilo-heavy steel plates in raw look more than positive. Absolute buy recommendation. And for the price almost three times already! Exactly the sound I was looking for gigs in small sites; I no longer sound in the frequencies of the voices and the guitars given its dark sound and low volume. A true success! Also the dark of their appearance makes them very attractive. In sonorized scenarios they also respond perfectly. The only thing that can be improved, to my liking, the ride bell I find very small. Very recommendable! ID: 403741 © 1996–2019 Thomann GmbH Thomann loves you, because you rock!